Major General Darryll Wong, Chief of Staff and Commander of the Hawaii Air National Guard and Valerie Fowler, Deputy Chief of Mission at the U.S. Embassy, Monday donated maritime hardware to Sri Lanka Air Force to assist the Sri Lanka military in ensuring the safety and security of Sri Lanka's territorial waters, a press statement issued by the US Embassy in Colombo said. "Safe and secure seas are in the interests of both our countries," the statement further said. In the meantime, Tamil Nadu fishermen along the coastal areas, continue to complain that Sri Lankan military has been systematically stepping up violence against them in the traditional waters of Palk Strait. Colombo, August 23, 2010: Officials of the United States Embassy presented the Sri Lanka Air Force with Rs. 674 million ($6 million) in equipment to enhance maritime security. 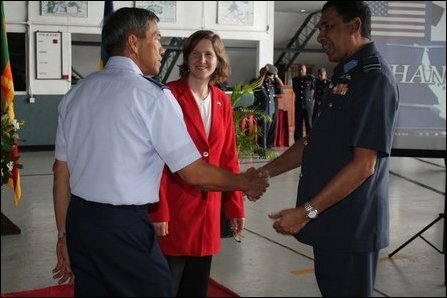 At a ceremony at Ratmalana Air Base, Valerie Fowler, Deputy Chief of Mission at the U.S. Embassy and Major General Darryll Wong, Chief of Staff and Commander of the Hawaii Air National Guard announced the donation to Air Chief Marshal Roshan Goonetileke, Chief of Defence Staff from the Sri Lanka Air Force. This hardware, including data links for two Beechcraft 200 aircraft, enables real time imagery that has assisted Sri Lanka in providing humanitarian assistance and responding to natural disasters such as floods. The equipment also assists the Sri Lanka military in ensuring the safety and security of Sri Lanka's territorial waters. The U.S. supports Sri Lanka in its efforts to combat human trafficking, piracy, terrorism, narcotics smuggling and other transnational crime. Safe and secure seas are in the interests of both our countries.